Sometimes you just want something easy, yanno? It’s the night before you do your big shopping for the weekend, and you’re scraping the barrel. You find some processed meat—okay, there’s your protein. There might be some limp green beans in the veggie drawer. And there are four slightly squishy small russet potatoes. I love potatoes, in almost any form (must be genetic). I love French fries. But I have a profound distrust of large amounts of boiling oil, so I don’t make French fries, or anything else that could be called deep-fried. Shallow oil or fat, no problem. But a couple of inches? No. It’s messy, it gets all over everything (including me), and I never know if it’s the right temperature. But! Out of desperation I arrived at a solution for those potatoes. Four small russet potatoes, peeled (larger potatoes might work, but I suspect the smaller ones are a bit less tough). 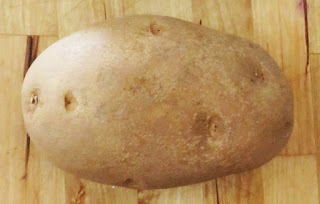 The russet variety will work much better than the waxy kind, which usually end up flabby. Put the shredded potatoes in a large bowl filled with water. Walk away and read for a while. 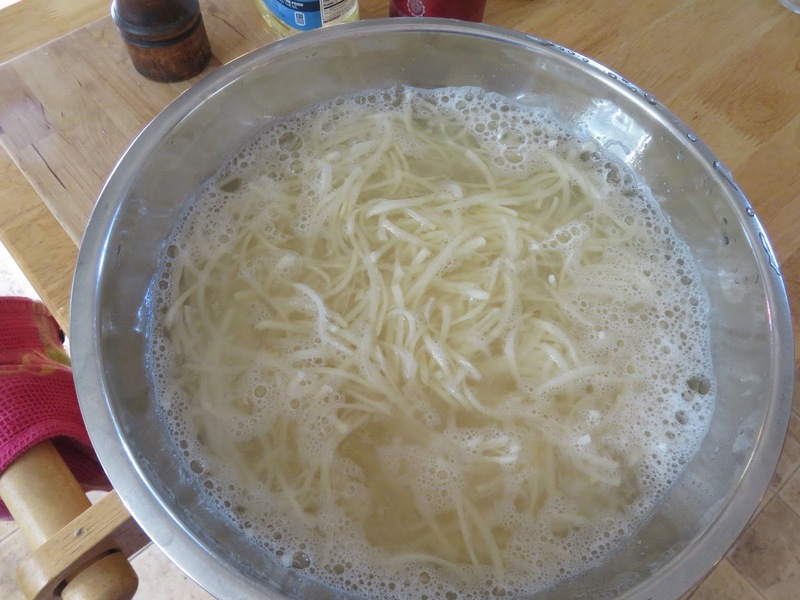 (Believe it or not, soaking makes a difference: it leaches out some of the starch from the potatoes, which if left in would make the potatoes gummy rather than crisp in the end). Soak the potatoes for at least half an hour. You will see the water get cloudy—that’s the starch. Drain them well. Blot them well with paper towels to soak up any excess water, or wring them out with a tea towels (assuming you can find one). You have heard that oil and water don’t mix, right? But don’t panic—they’ll never be totally dry. 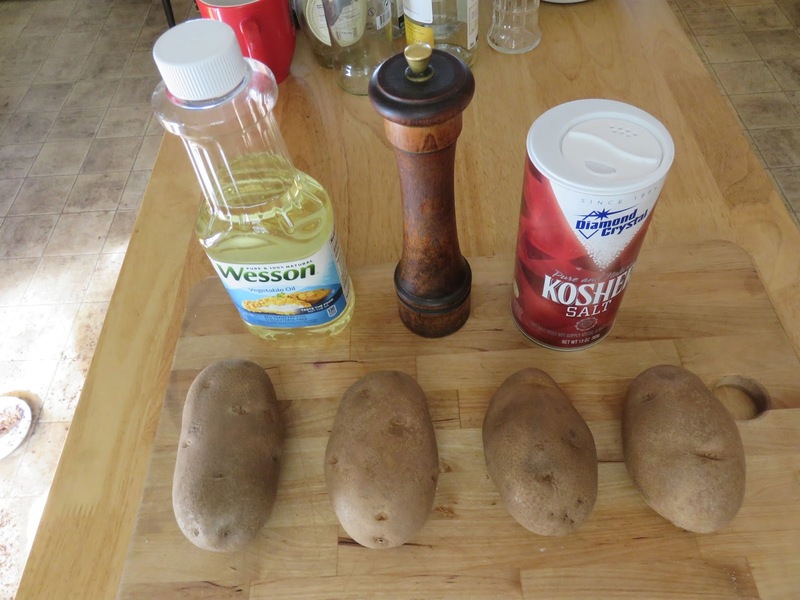 Put your now-dryish potatoes into a large bowl and toss with oil, salt and pepper. 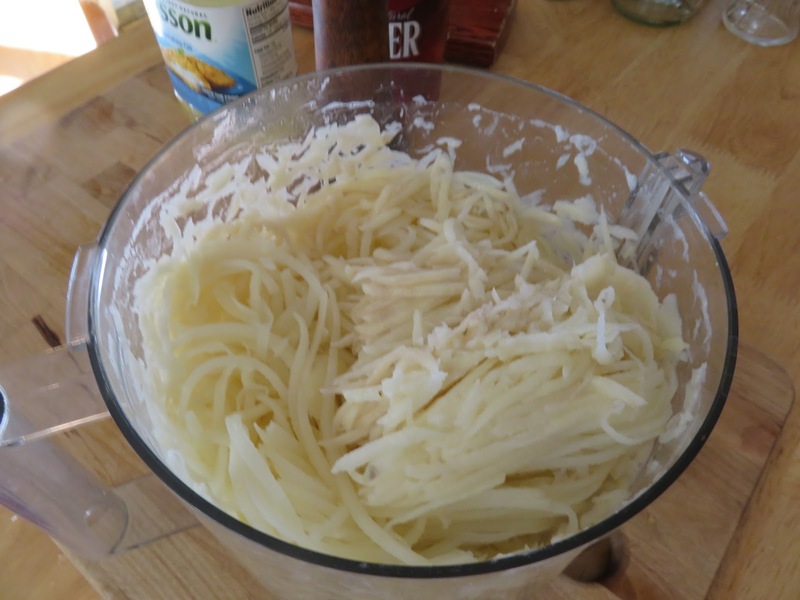 The oil should coat the potato shreds nicely, but don’t drown them. If you’re feeling bold, add a dash of cayenne pepper. 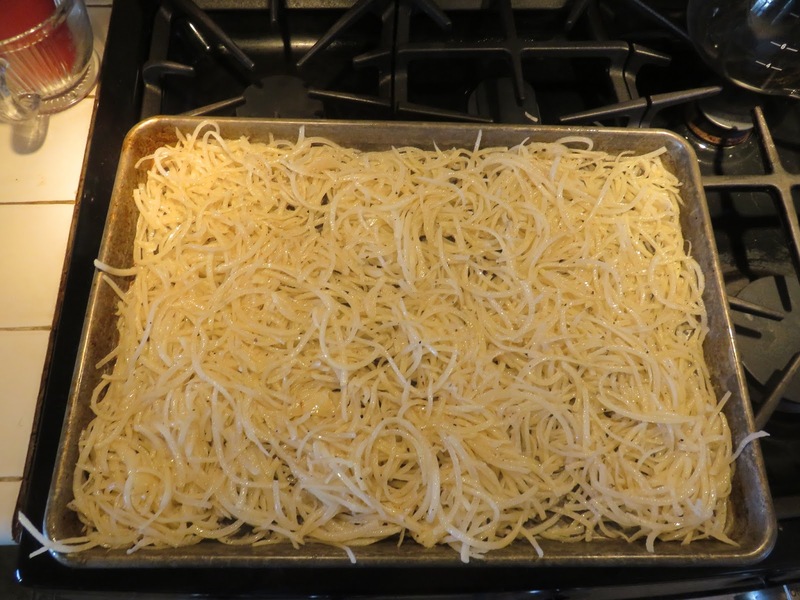 Spread the potato shreds on a large rimmed baking sheet, making an even layer. Bake in the preheated oven until the potatoes are golden brown (about half an hour). The bottom ones will be crustier, but they’ll get mixed in when you pry, er, remove them from the baking sheet. Yeah, okay, you could probably mix them up during cooking, but that oven is really hot—do you want to have to open it? And a tip: let the whole thing cool for a couple of minutes—the potatoes will come off the baking sheet much more easily. Break them up and serve them with whatever else you scrounged (boneless pork chops in my case--don't worry, there's a healthy green salad lurking in the wings). They’ll be crisp and crunchy (and actually stay that way for a bit), and almost healthy. Or just go ahead and eat them the way they are. See? Simple. 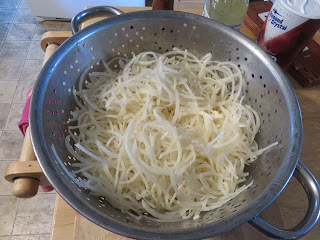 A flurry or two of preparation, with plenty of time to do something else in between, and you get skinny, crispy potatoes that will go with almost anything. Seeds of Deception, coming in October. It takes place in winter (there's snow on the cover!). The sequel, in progress and still unnamed, also takes place in winter. Didn't I plan my writing schedule well? Since it's going to be over 95 degrees today. Again. Thanks for the recipe! You can never go wrong with potatoes! Looking forward to Seeds of Deception! I think if you slice them thin enough, and soak them, that should work. I haven't tried it yet. Potatoes always hit the spot no matter how they're prepared. 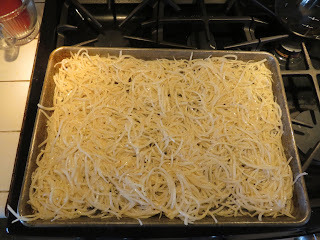 This recipe looks tasty and a great way to get away from frying them. Yum! wonder how sweet potatoes would work? I have no idea if the textures are different. Try it and report back! This looks good and the water tip is awesome. I read somewhere that in the Victorian era, the servants would save the water that potatoes had been boiled in and use it for starching clothes. Getting rid of the starch does make a difference here! I always have a few potatoes in the bin. Either Idaho for baking or Yukon Gold for everything else. I'm going to Pinterest the page to save the recipe and try it in the near future. I'm going to try this today! Now that sounds good and easy! I did this and added a garlic cheese sauce to the top to make it like a garlic pizza, my kids loved it. It would probably work well with cheese sprinkled on top while the potatoes were still warm. Nice and crunchy! Hi Sheila: I know you are aware of how much I have loved the Orchard Mystery series so I am waiting anxiously for the next books to be released. 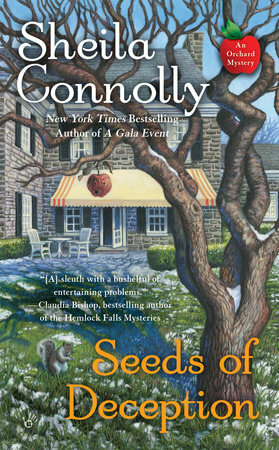 The cover for Seeds of Deception is amazing. I love covers that have details and sometimes I look for clues to the story in a cover. 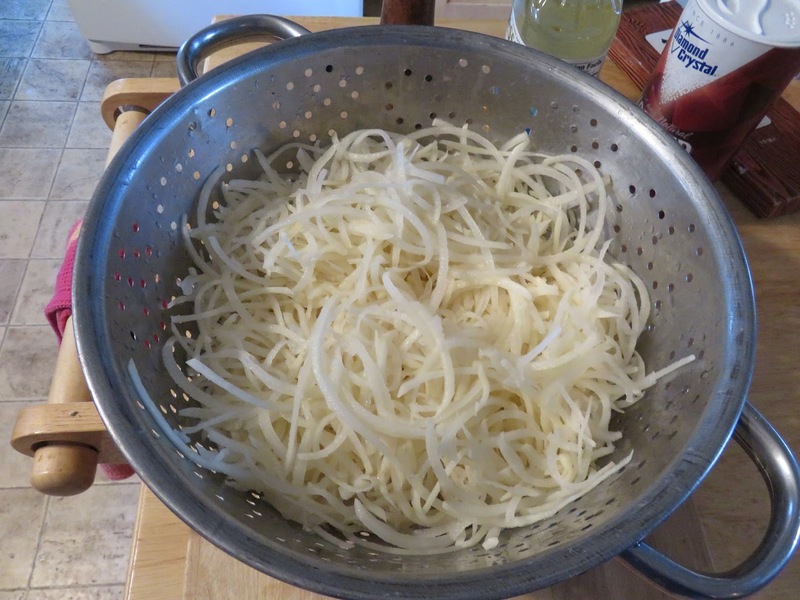 I make hash browns the way you made your potatoes and I add finely sliced onions or at least onion powder or granulated garlic to them as well. Freshly ground Himalayan pink salt adds a nice touch to potatoes for anyone who likes a little added flavor from salt that isn't too "salty". Can hardly wait for October to hear from Meg and Seth again. I love how many salt varieties are available these days. You can change flavor with so little work! I sent Meg and Seth to Monticello to see the orchard there because I took myself one year (in the spring) and it was lovely. Jefferson really cared about his apples. I know what you mean. 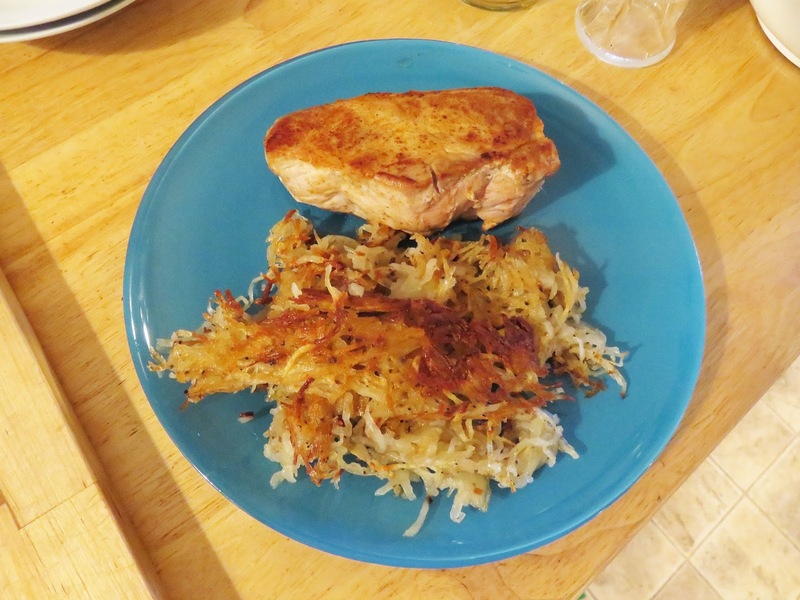 I've found it works better with left-over boiled potatoes--they come out crisper (don't ask me why!). Assuming you have any left over, that is. The potatoes sound very good! And TWO books set in winter? I love it!